GBA Pokémon: FireRed Version (USA) in 1:44:17.34 by MKDasher. 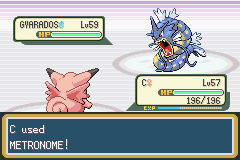 Pokémon: FireRed Version is an enhanced version of the original Pokémon: Red Version. Many glitches have been removed, and the random mechanics behind wild encounters have changed. This leads to very different strategies compared to our fastest runs on the original generation of games, and as a result, runs of this game see much more of the plot. Watch as MKDasher crushes this game using Clefable (the first evolved form of Clefairy) and lots of luck manipulation. This run improves the previous version by over 2 minutes by fighting most battles with Clefable instead of Squirtle and using Metronome (which picks a random move to use from all moves in the game) against the Elite Four. There is also an encode here that contains interesting data like PP left for each move, Pokémon stats, and some commentary on the run alongside the video.